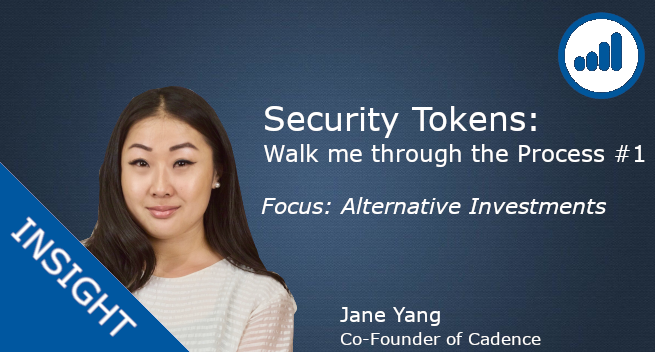 In our new Series “Walk me through the process” we will learn and understand more about the cost-saving effects & efficiency improvements blockchain technology / Security Tokens can bring to the financial industry. Therefore, we will interview experts within one investment class (e.g. Real Estate, Bonds, Shares, Alternative Assets etc.) walking us Step by Step through the “traditional” process of purchasing or trading an asset and then compare it with the “new” process enabled by blockchain technology what we refer to as Security Tokens. 1. What problem is Cadence trying to solve? Alternative investments such as private credit are a great way for investors to hedge against the volatile public markets and generate passive income. However, investing in these private markets is difficult and opaque, posing challenges for both investors and specialty lenders. Unlike the public markets, where technology continues to evolve with the demand and support of large banks and exchanges, the private credit markets remain antiquated. For the specialty lenders in this space, the fundraising process is still heavily manual, costing them time, capital, and resources. On the investor side, many who are looking to participate are denied access to viable private investment opportunities because of high barriers to entry and the inability to find these investments at scale. 2. What are “Alternative Investments”? Why do they matter? Alternative investments are investments in asset classes that are not stocks, bonds, or cash. They are important to consider in any investment strategy because they have low correlation with the traditional financial market, thus they can reduce overall investment risk through diversification. 3. How does a typical investor journey looks like today? What are the obstacles for investors? Today, if an average investor wanted to participate in the private credit market, the first step would be to have the right contacts, which is a much bigger challenge than it may seem. Institutions such as family offices and credit hedge funds maintain their edge by hoarding relationships with credit issuers in order to maximize their returns. These alternative investments are usually offered on a who-knows-who basis. Even if an average investor were to have the right connections to the credit issuers, investment opportunities with attractive yields usually require a high minimum investment and/or long duration with little liquidity options, thus restricting investor participation. The reason that credit issuer haven’t been able to expand their investor base is mostly for economic reasons stemming from the lack of technology. Unlike the public markets where technology continues to evolve with the demand and support of large banks and exchanges, technology in the private credit markets remain antiquated. The fundraising process is still heavily manual, costing credit issuers time, capital, and resource. This makes it economically inefficient for a credit issuer to take on smaller investors. 4. How can Security Tokens improve the process for investors? What are the overall benefits that can be generated? Security Tokens offer investors and issuers the transparency they seek to engage in an efficient marketplace. Information is stored in smart contracts driving Security Token mechanics, which will include the real time status of the borrower, underlying assets, external factors, investor allocations and security characteristics such as principal amounts, coupons and payment dates. This information, now transparently available, can then be called upon to execute real world actions in a codified manner. This all translates into an extremely transparent, streamlined, auto-executable process for investors with the overall benefits far outweighing not only what is currently done in the private markets, but in the public markets as well. 5. Can you give us an example that illustrates the cost savings and other specific advantages by comparing a “traditional” and “new” process with each other? A specialty lender is lending a borrower $1M for manufacturing of the borrower’s product. The lender must solicit investors to fund this loan, managing investor relations and underwriting process with each new investor, usually spending money on marketing. On average, fundraises such as this takes 2–3 months, costing the specialty lender around $80K USD for each new investment vehicle. For investors who want to participate, they would have to source these investments either by introduction or cold searching. Since onboarding process is so costly to the originators, they to not take on new investors easily. Even when a new investors is accepted to participate, the investment minimum for a $1M deal can be $100K or more, a high barrier to entry for many investors. This dilemma creates inefficiencies and asymmetry in the private credit market, causing problems for both investors and lenders. The lender (after passing Cadence’s proprietary risk management due diligence) posts the investment opportunity on the Cadence platform to start fundraising. Fundraising process on Cadence typically only takes a few days, as Cadence has a robust investor base. On the investor side, any investor who is US-based and accredited can sign up for a Cadence account (after passing standard financial services KYC/AML and OFAC check). Investors simply log onto the Cadence platform to view a list of investments and participate as they please. Since Cadence has automated the fundraising process using distributed ledger technology, we have cut down the operations cost. Thus, our minimum investment is only $500 USD, making private credit investments available to a broader investor base. 6. What are the biggest upcoming challenges for Security Tokens to thrive within the area of “Alternative Investments”? 1. Regulations — Security Tokens are simply digital representation of financial instruments. Thus, compliance with financial regulations will be crucial for establishing trust with institutions. From solicitation to issuance to the secondary market, each step of the tokenization process should comply with the regulators such as the Securities and Exchange Commission (SEC). 2. Privacy — Data privacy is always a major concern of financial institutions. Despite the anonymity nature of blockchains, confidentiality is undermined when a public blockchain is applied to the massive number of transactions such as those of a bank. To be trusted financial instruments utilized by banks and other institutions, permissioned blockchains may need to be considered, such as J.P. Morgan’s Quorum. These blockchains allows all transactions to be verified, but only pre-authorized nodes are privy to the details such as economics and investor information of a security. 3. Performance — To be comparable to traditional financial instruments, Security Tokens must perform with the same speed. Current public blockchain such as Ethereum are notorious for being too slow for scaling to large transaction volumes, which is unacceptable in financial services. As blockchain technology matures, better consensus mechanism will improve the number of transactions per second to better suit the utility of large institutions.